Every once in a while I see a battered 1990s era Honda Civic buzzing down the interstate, literally bouncing down the road. The usual suspect behind the wheel has probably elected to either install aggressive lowering springs or simply torched his factory coils to get a massively slammed ride height. The obvious negative is the car now bounces on the bump stops like a waitress who just won the lottery at Hooters. It’s a bad visual when applied to car suspension, and it’s nothing but an embarrassment to automotive engineers and enthusiasts worldwide. 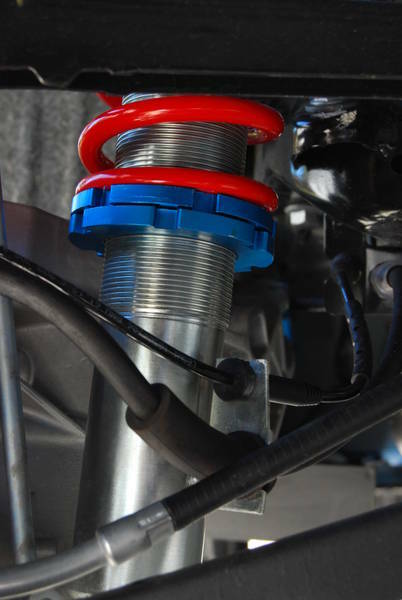 The proper way to attain that “just right” stance is to find a set of suspension bits that maintain suspension travel, yet position that suspension travel at a lower ride height. 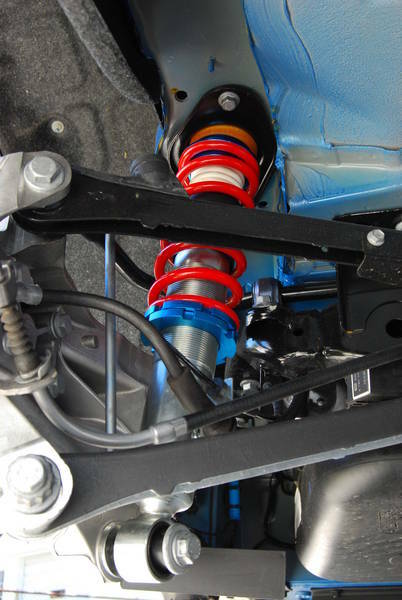 With the automotive aftermarket seemingly keen on keeping most critical specifications secret, it’s quite a mystery which suspension package will help and which will hurt. 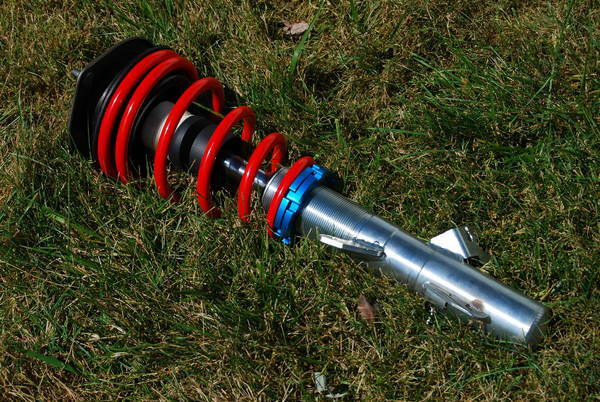 To get your MINI out of the clouds, a coil-over suspension package that uses shorter damper bodies yet maintains the same overall stroke as stock is in order. The coil-over name comes from simply having a damper with a coil spring mounted coaxially over the damper, it’s that simple. In the MINI, that comes in the form of a MacPherson strut up front and a coil-over damper connected between the trailing-arm and chassis in back. VMaxx is a suspension company from The Netherlands and has recently embarked on an aggressive marketing campaign to promote their new lineup of suspension products. 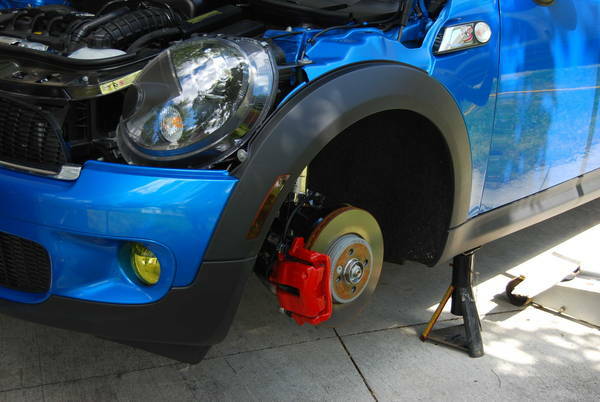 One of those new products is a coil-over suspension kit for the MINI. 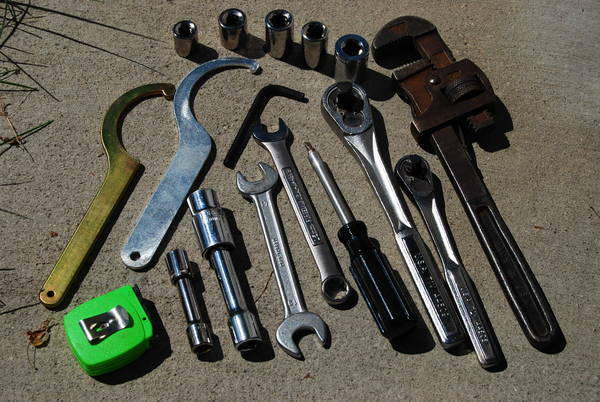 It is a MINI-universal application for all R50/52/53 and R55/56 models. 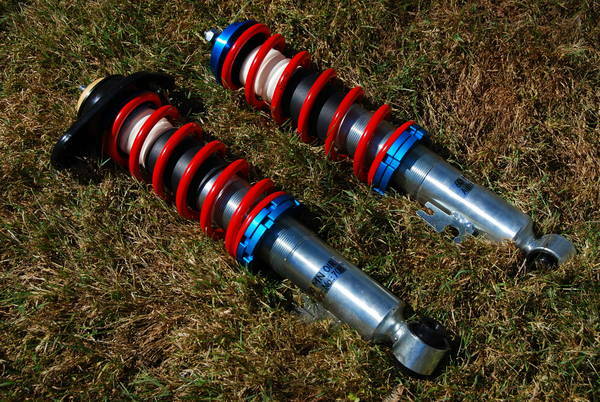 Coil-over suspension systems have a well-deserved stereotype of being the rich-man’s suspension upgrade. They offer lots of adjustability [depending on the model you choose], supercar performance and show-car looks. V-Maxx enters this rare air with a $649 price point, which is about the same as a damper rebuild service for high-end systems. Their low price point brings coil-over aesthetics and performance to the real world where most car enthusiasts can realistically slot them in their short list. V-Maxx U.S.A. importer Stratmosphere states the V-Maxx coil-overs were designed to perform similarly to the excellent KW Variant 1 system at a fraction of the price. Are the V-Maxx an eBay special that will make your MINI bounce like a chopped up Civic, or can they genuinely join the coil-over elite? The shipping box arrived at my garage without any accidental ventilation holes in it or damage, which is always nice to see. The packaging is a nice double-walled corrugated cardboard setup, which protected its contents very well. I’ve seen much more expensive components shipped in significantly lower-rent containers. Opening it up, the parts are neatly arranged within the box, each damper in its own sub box while the front springs are packaged bare but not loose between some thick papers. The R56 trailing arm adapters are in a bag and tied to the lower damper mount of the rear damper units. So far the ante is being set pretty high. No instructions are included, and only one spring perch wrench included. Stratmosphere comments that they expect the kit to be installed by a professional shop, hence the lack of instructions and only one wrench. Ok, a few trivial things missing, but no catastrophe. At least the R56 trailing arm adapters are included no matter what. Let’s take a closer look at the individual components. The dampers are magnetic steel, probably mild steel, and have a galvanized finish. The welds are clean and penetrative, however on the front strut sway-bar drop-link mount the weld does not go around the complete circumference, missing the final 1/16”. This may cause long-term rust concerns, however not an immediate strength concern. All the mounting brackets for the brake hydraulic and ABS sensor lines look exactly like stock, which keeps things easy. The chrome on the damper shafts looks good, and the nuts that hold the top hats to the damper shaft are a wave-spring lock nut. There are bump-stops, bump-stop plates and dust boots included. 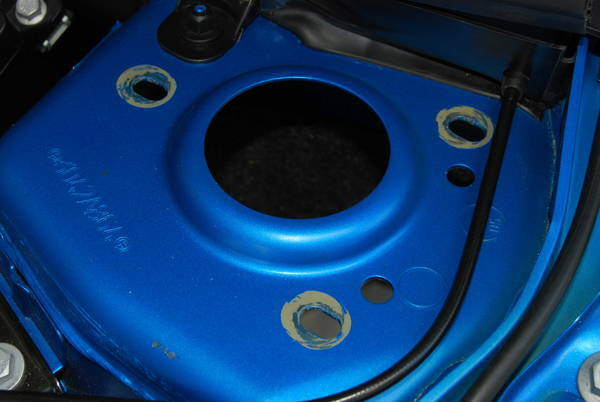 The bump-stops appear to be made from microcellular foam, much like the OEM bump-stops. The dust boots attach to the bumpstops to ensure the damper shaft is minimally exposed to the elements. The spring perches and rear upper spring perch are all made from billet aluminum and anodized blue. The spring perches are not perfectly machined in that there is a bit of slop between them and the threads in the damper body. This isn’t a functional problem, just a perceived quality quibble. The R56 trailing arm adapter appears to be bare aluminum, which is fine; there’s no need for any fancy coatings. I was curious to find out how these super-value dampers compare to stock. While I don’t have a real damper dynamometer, it’s easy enough to put one end of the damper on the ground and push against it from the other using my body weight and varying my speed. With this basic method it’s fairly easy to determine relative damping resistance between dampers in the realm of low and high speed compression damping. Checking out the rebound damping in the same fashion is a bit tougher, so I’ll wait to feel the rebound damping during the test drives. What did I discover? The compression damping of the V-Maxx is very similar to the stock R56 dampers [non-sport version]. They are mildly digressive, which means they have greater low speed damping and less high-speed damping. 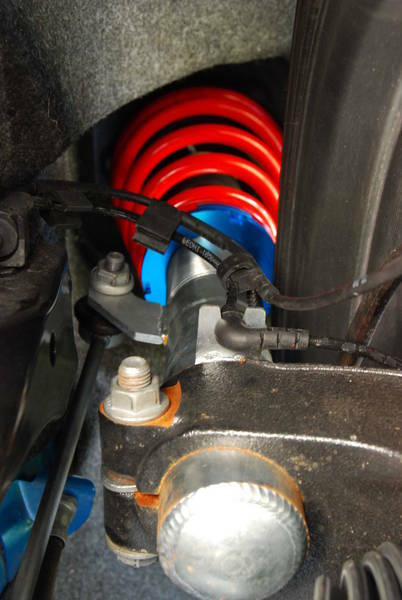 The V-Maxx does have slightly more damping in both regions compared to the stock dampers, which correlates appropriately with the stiffer spring rates. This means the bump and pothole ride quality will be very similar to stock, with perhaps a bit better body control. I mentioned stiffer spring rates. How stiff, you ask with a bit of teeth-clenching nervousness? The springs appear identical in shape and gauge to their performance target, the KW V1. The front beehive/conical shaped springs are difficult for me to tell the rate other than it’s progressive. The average rate is probably slighter stiffer than stock. The rear spring rate is a bit of a giveaway, as the rear spring has “200” silkscreened on it. This probably means the rate in pounds per inch. This is about 46% stiffer than the stock rear spring rate of about 137 Lb/In if my math is correct. 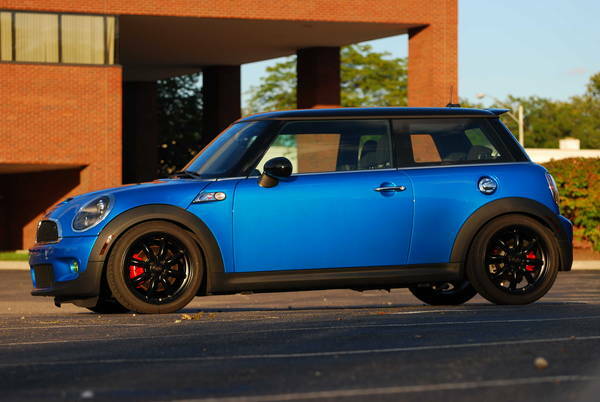 Don’t let the percentage scare you, this is not a super-stiff spring rate for the MINI. 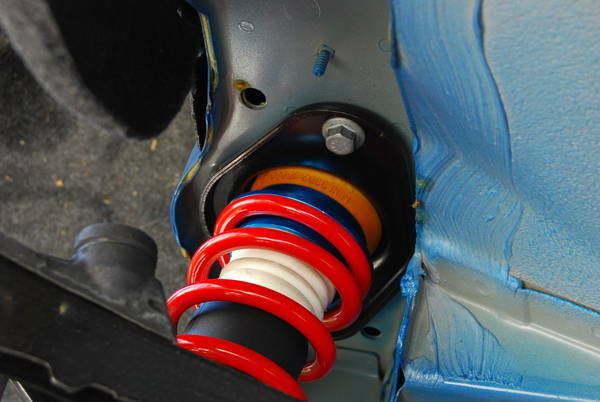 The stiffer spring helps keep the suspension handling balance neutral when the ride height is lowered, due to the change in roll-center. V-Maxx paid attention to the tuning details here, which pleases me. The fact the springs are also powder coated a nice shiny red also pleases the go-fast gods. The V-Maxx coil-over spring perches were not pre-set out of the box. This mandates initial installer tweaking. Since there are no instructions included, there may be several trial-and-error sessions before the desired ride heights are achieved. Since V-Maxx’s performance target is the KW V1, and they are almost dimensionally identical, the KW instructions are a perfect starting point. Thankfully I have a set of such instructions printed out in my garage. I also have an extra coil-over wrench that was needed to tighten the spring perches. I realize most do not however, and I feel it’s lacking on V-Maxx’s part to only include half of the required esoteric tools. To cut through the ride height trial-and-error, my settings ended up as follows. Set the front perch to 8.0” from spring perch surface to lower mounting bolt hole axis [where the knuckle clamps the strut]. Set the rear perch to 7 3/8” from the spring perch surface to lower mount bolt hole axis. These will put a minimally optioned R56 MCS [no sunroof, navigation, or leather] at 24.3” front and 24.6” rear ride height [from level ground to bottom edge of wheel arch apex]. This ride height maintains the identical compression-to-rebound travel ratio as stock, where ~3.2” of the ~5.0” total stroke is used for rebound travel and ~1.8” is compression travel. You may choose to vary this ride height position to your liking; however, understand you’re changing the nature of the vehicle behavior by altering the ratio of compression-to-rebound travel, not just moving the ride height. 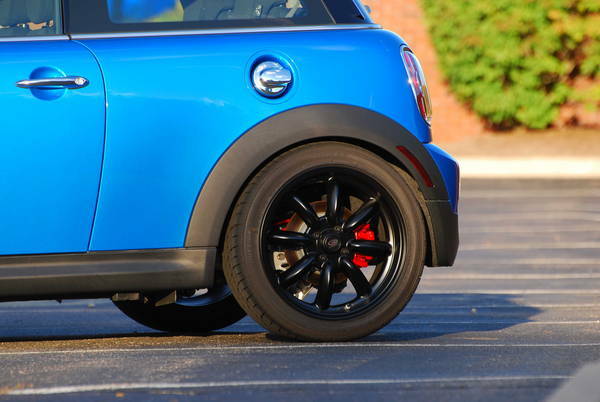 I would not recommend more than a 1” deviation from this R56 ride height. Those that want a “slammed” ride height will have to be willing to give up some ride comfort, especially with large bumps. It’s worth mentioning the ride height did settle a tiny bit over about a week period. The settling was very minimal, about one tenth of an inch. This indicates the coil springs included are of good quality and/or have been pre-sagged from the factory. In any case, there are no excuses and no surprises here. One very important factor is these coil-overs do not work with factory R56 front anti-roll bar droplinks. 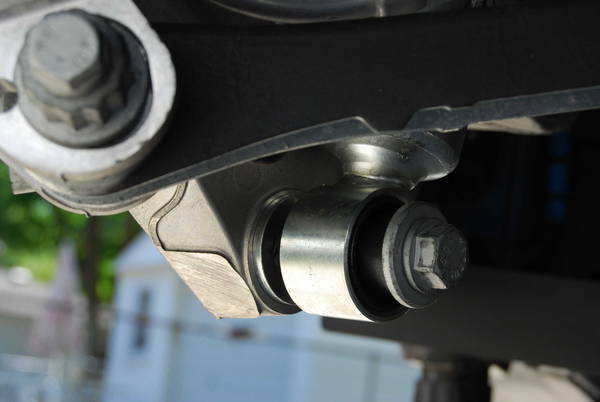 The final 1” of rebound travel creates interference between the drop-links and the control arms. Shorter front drop-links are mandatory! Since the R50/53 chassis uses shorter front anti-roll bar drop-links, the V-Maxx coil-overs may work fine in this application; however, I have not confirmed this, so all R50/53 owners that enjoy these coil-overs will want to check the drop-link does not interfere with their front control arm. The installation of these coil-overs is very easy. 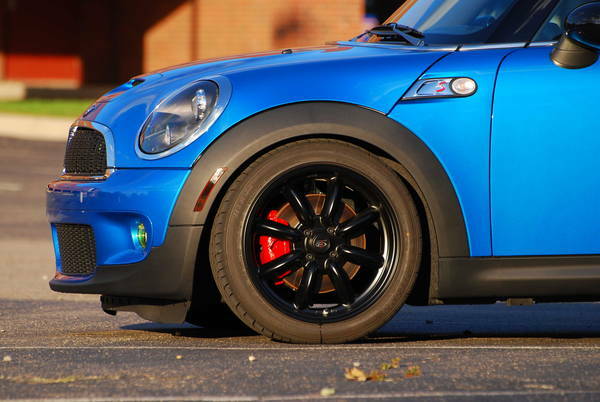 If you have installed lowering springs on any MINI then installing coil-overs is basically the same. There are many installation threads on NAM that can help. Just as well, the Bentley service manual will help the beginner enthusiast tackle this simple job in no time. 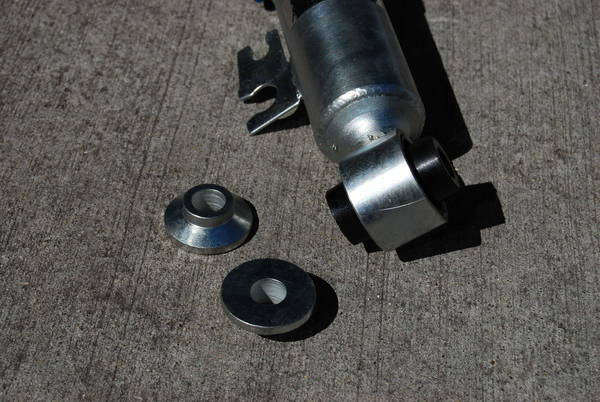 Other than adjusting the spring perches and sourcing new front anti-roll bar drop-links, the installation of these suspension bits went butter-smooth. Be sure to have that 22mm socket handy, and I use a very old pipe wrench to help snug the damper top nut to the assembly top hat. V-Maxx uses a larger diameter top nut on the front dampers for reasons unknown. 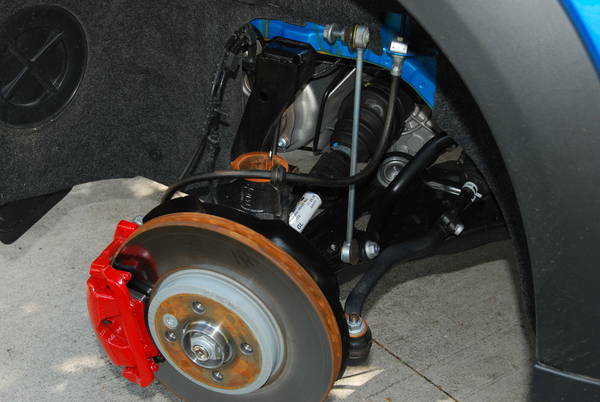 A competent shade-tree mechanic should be able to complete the entire installation in about two hours, including getting the car on and off the jack-stands. 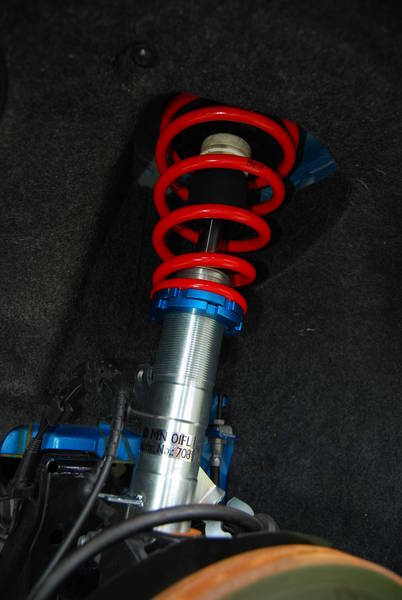 Since there are no damper settings to fiddle with, once the desired spring pre-load [used to adjust ride height] is attained, settle back in the driver seat and take the new suspension for a drive! If you have ever been an OEM test driver, you spend countless hours driving the competition, and endlessly tuning, recording, and debating the merits of different setups. 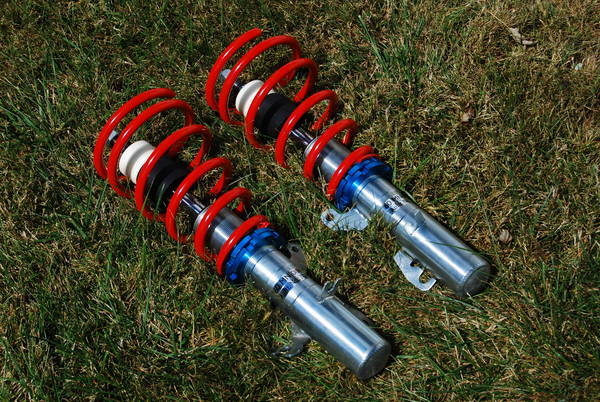 The chopped-spring solution from that Civic isn’t usually in the cards; however, what does come up is the overall style of how the suspension feels. BMWs are famous for their exquisitely solid balance between handling and comfort, all while invoking maximum driver confidence. Mazda tends to focus on precise handling feedback while offering supple bump absorption and isn’t ashamed to involve the driver with lots of body motion. Japanese cars feel different than German cars which feel different than American cars, as a generalization. From the first drive around the block, it’s clear the V-Maxx coil-overs are less like their German performance targets, and more like a Japanese performance target. They clearly have not copied the KW V1 damping curves. The V-Maxx have a bit less damping in every category: low-speed compression and rebound, and high-speed compression and rebound. When combined with the same spring rates as the KW V1, makes the V-Maxx certainly more compliant around town, but also a touch more animated in performance driving. Quick throttle transitions mean plenty of weight transfer. Mid-corner yaw corrections are a throttle-lift away. Mid-corner bumps do upset the attitude of the car, causing the tires to tend to skip over huge bumps or potholes. Boulevard cruising is significantly more comfortable than stock. Reference neighborhood bumps, ledges, and manhole craters have virtually vanished. VMaxx chose to shift the handling balance a click from absolute performance to comfort touring. The V-Maxx dampers appear to be a bit noisy. With some damper brands you can hear the oil squish over some bumps; with the V-Maxx it sounds like something isn’t as tight as it could be, as if there is some play in the piston or discs internal to the damper body. To ensure I didn’t make an installation mistake, I re-checked all fasteners and found everything torqued to specification. While it doesn’t appear this noise hinders performance or comfort, it may be objectionable to some people particularly sensitive to suspension articulation acoustics. One such friend of mine I would categorize as such rode passenger and while he did notice the noise, he did not find it as objectionable as the road noise of my max performance summer tires! The V-Maxx coil-overs aren’t exactly what I expected when compared to their performance target, however they are exactly what they need to be for most customers; comfortable, affordable, and do not negatively impact the handling of the MINI compared to stock. I can confidently recommend these coil-overs to most people that are looking to lower their MINI without breaking the bank, or their back. They do not ruin the handling prowess of the MINI, yet they shouldn’t be confused as a full-on track-day suspension package. 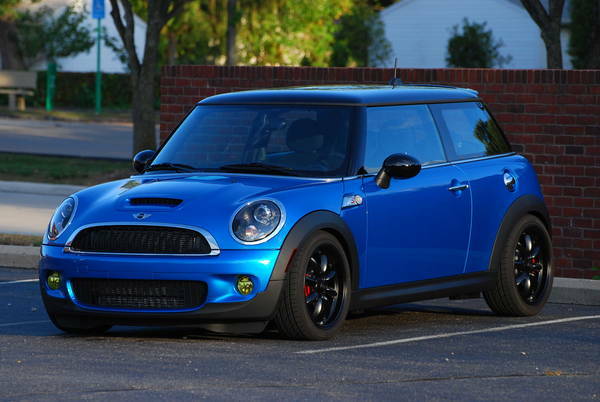 The type of MINI enthusiast that appreciates good looks and good comfort without requiring massive racetrack prowess won’t miss the last few ounces of handling anyway. That said, don’t confuse the V-Maxx as an alternate to BMW ///M “Jack of all trades” performance. The V-Maxx coil-overs don’t have the solid refinement of their KW Variant 1 performance target, but at half the price they have fewer excuses than simple lowering springs. 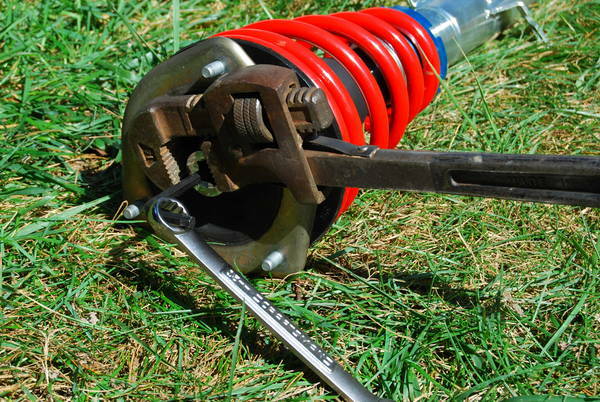 Once V-Maxx starts offering the shorter front anti-roll bar drop-link, I will wholeheartedly recommend these coil-overs as the new “lowering spring,” in that they get the job done with minimal installation fuss and reasonably attainable financial investment. • Peter Ryckaert, co-owner, Stratmosphere, Inc.